There’s not a lot more fun you can have than being able to play with water guns and many people’s favorite childhood memories will be running around trying to spray their friends with water. They can differ greatly in quality though and getting the best super soaker is important. In order to choose the best water guns there are many important aspects to consider with the overall quality and size being crucial issues. The last thing that you want is for the fun to have to stop as one of the water guns has broken. In order to ensure that doesn’t happen, we have completed water guns reviews to show you the best products on the market and also have developed a buying guide to show you exactly what you should be looking for. Once you’ve read through this, you’ll know exactly what you need. 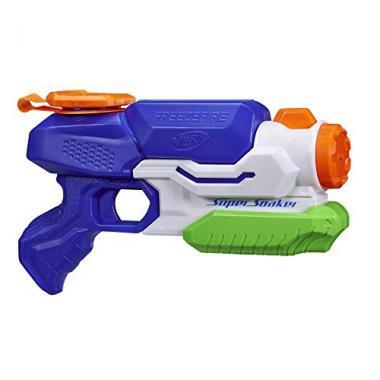 This is a top rated super soaker from Nerf and they have long been a company who has developed a great reputation for making high-quality children’s products. This is another great example with this super soaker that has a compact size but a lot of fun. It’s a product that has a high amount of durability and quality to ensure that it is safe to use. It comes in a pack of three and they are going to be able to hold over three ounces of water. They are also able to reach 20 feet away to give you a whole world of fun. This a squirt gun from Prextex is able to give a large amount of spraying time due to the backpack that it has. That backpack is connected to the water gun and it also has fun fireman branding. A fireman hat is also included so that your child can pretend they are putting out those fires. The water gun would be perfect in a wide range of different situations and is able to shoot water at a distance of up to nine meters. 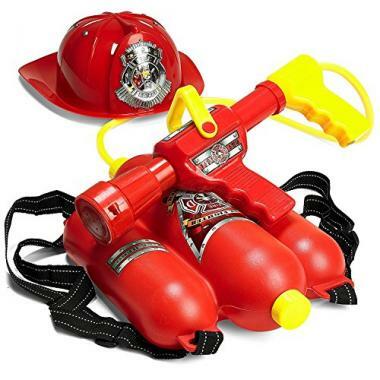 This is a well-reviewed product that is going to be ideal for kids who just can’t wait to be a fireman. 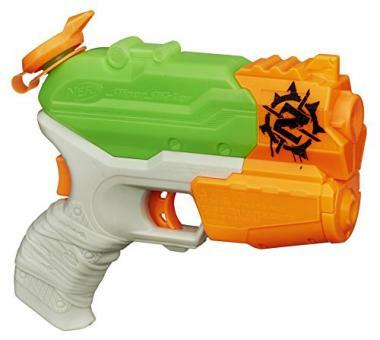 This is another great water gun from Nerf and comes with the usual level of high quality that you’d expect. It is also highly durable too and therefore you know that you or your kids are going to be able to play with it for a long time. It has a pump handle and is able to deliver five streams at once to give it maximum coverage and a flip-up sight to give you a better level of accuracy. The blaster has a 22-ounce capacity that should be able to give you a lot of fun. 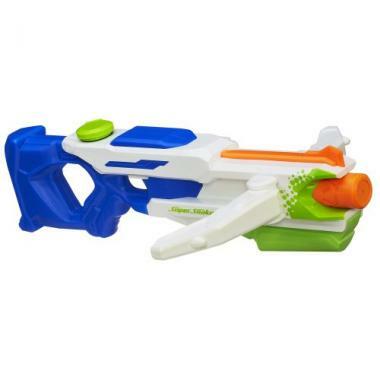 Nerf have been able to produce this powerful water gun that is able to soak targets from up to 38 feet away and has a very large capacity when it comes to other water guns as it is able to hold up to 84 ounces to give you a lot of time to soak anyone. One great feature about this product is that it has three different features available on it to mix up your water blasting as you are able to shoot it in a scatter mode, a flood more or you are able to shoot as far as you can in distance mode. If you are looking for water guns for adults then this could be the best choice but it can equally be used by the kids too. It has a pump to fire action that requires a bit of effort but you’ll hardly notice when you are trying to soak everyone around you. It is also able to hold up to 50 ounces and that is going to be able to give you a very high capacity to work with. It can also blast water up to 38 feet which is up there with the best models on the market and is also highly rated. This is a long-range water gun that is able to shoot up to 38 feet which should be more than enough distance for your needs. It has a pump handle to help you fire and comes with the build quality that you’d expect from Nerf. It is able to hold 23 fluid ounces and gets its name of Freezefire from the fact that it has a large opening hole to it, enabling you to add ice and give people a cold blast. It is well rated and is sure to give you many hours of fun. This water blaster toy is going to be great for taking to the pool as it will be able to pick up water after being submerged and then will spray it at a very impressive rate. It’s made of high-quality materials and it has been built to last. Perhaps the most impressive aspect of this product is that it is able to shoot a stream of water up to 70 feet. It is able to keep a shot of water loaded in the cannon and it also comes in a slightly smaller version if you’d prefer. 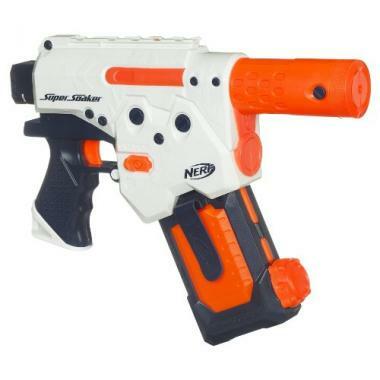 This high power water gun from Nerf is another great product and one that is motorized to be able to give you a continuous blast from 25 feet away. That means that no pumping is required and you will be able to just pull the trigger. Another cool aspect about this product is that it has a water clip that you will be able to attach to the blaster and spray away. It comes with a reload water clip and can easily be used with one hand which makes it one of the easiest to use water guns on the market. This is the ultimate water gun for having fun due to the fact that it has deployable arms of a crossbow that when stretched out, will give you three steams of water for a wider area of coverage. It’s a great feature and one that is unique to this water gun. Then not wanting to use the crossbow arms, you will be able to fold them in and create a single long distance stream. The water gun is able to hold up to 40 fluid ounces of water and can soak targets that are up to 38 feet away. 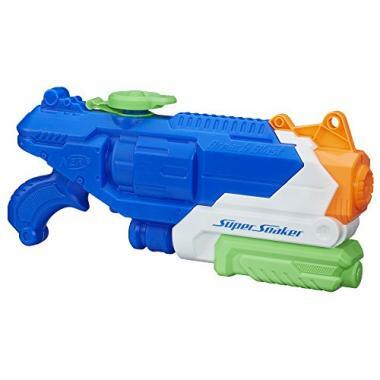 This is one of the best super soaker water guns of the market for those looking for something that is a one-handed model. 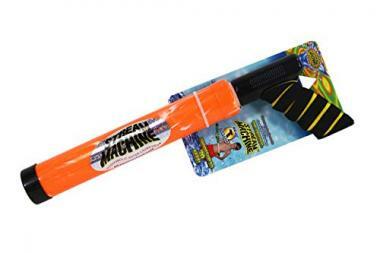 It is highly durable and should be able to cope with a lot of water shooting fun and can shoot up to 20 feet away. It is able to hold four fluid ounces and has a tank that is able to light up when in use. This is great for younger kids who might not be able to hold the full weight of a larger model and also due to its ease of use with no pumping required. The overall size of the water gun is going to be important and a lot of this will come down to who is using it and where you plan on taking it. Water guns can be fun in a wide variety of different environments and scenarios. The first question that you need to be asking is who is going to be using the water gun? They are generally seen as a toy for kids but that doesn’t mean that adults aren’t able to have a whole load of fun while using them as well. As far as adults go, you’re obviously not going to be limited by the size when it comes to your water gun as you’ll be able to use any model that’s out there. If it’s for children’s use though, you need to consider who old they are and what they can carry. If you try to put a large super soaker into the arms of a four year old then they won’t be able to carry it very well and they are not going to be able to hold it. This is where you obviously need to get a product that is going to match the user. 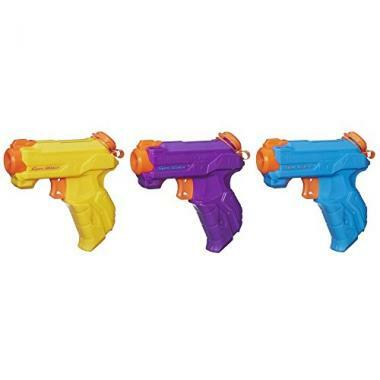 Thankfully these water guns come in a whole range of different shapes and sizes, therefore you are always going to find the perfect one for whoever wants to play. Size is important but other factors are going to be essential too. There is also the consideration of travel too and where you intend be taking your water gun. If you want to take it on vacation, then you will want to make sure that it is going to be able to fit in with all your other items and that you can easily travel with it. A water gun is nothing without water but each gun is going to have a different level of capacity that they will be able to use. This can vary quite a lot and you also have to consider the action of the gun too when thinking about the water capacity. You’ll see that these water guns are going to be measured in fluid ounces. One fluid ounce is just under 30 milliliters of water and obviously the higher this number, the higher the volume that you are going to have in your water gun. The water capacity that you will be looking for depends on a few key factors as it’s going to be affected by the weight, the amount of time you intend to be using the water gun for and also the type of water gun that you have. Each gun that you have will be able to fire out water at a different rate and this will be affected by other factors such as how much the water gun has been pumped. This makes it hard to specify exactly how long each tank would last while firing. As a basic rule though, the more water your gun is going to be able to hold, the more time that you are going to be able to spend between refills enjoying spraying the enemy with that water. Some of these guns are able to hold a very large capacity of water to give you many hours of fun. Sometimes you would prefer a smaller gun though or perhaps one that you are going to be able to use with one hand. 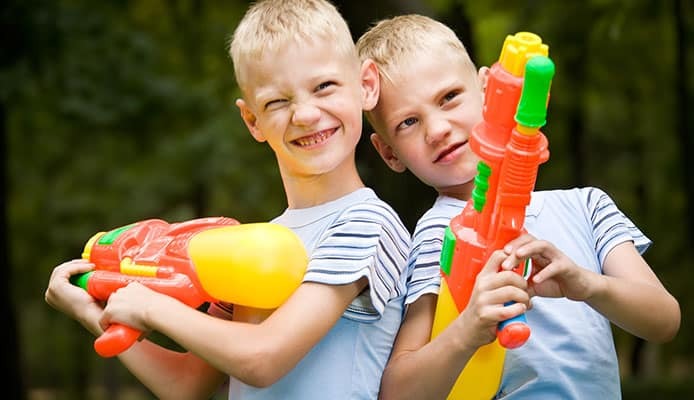 These types of water guns aren’t going to be able to hold the same capacity of water but can still be a lot of fun to use, especially if you’re looking for fun things to do at the beach or are looking for fun games with pool toys and floats. When looking into what type of water gun you should get, weight is going to be an important issue as you also have to consider who is going to be using it and what type of weight they are going to be able to hold. The biggest water guns aren’t going to weigh that much and should only be a couple of pounds by themselves. These should be able to be picked up by almost all users and therefore the weight of the gun isn’t a massive concern. What can play a significant role in the overall weight of a product though is the weight of the water that is contained inside of the gun. This isn’t really going to be an issue if you have a smaller gun but that weight can build up into something quite significant. 16 fluid ounces weigh just over a pound which isn’t a significant amount and a lot of these products will be in the 20’s range when it comes to how much water they can hold and therefore the water inside should only weigh around 1.5 pounds. That is going to be manageable for most users but there are other water guns that are going to be able to hold a lot more water. We have one water gun here that can hold 84 fluid ounces which when full would weigh around 7.5 pounds with the weight of the water included. The weight of the water is just something that you need to take into account before you decide to buy the water gun. Children love being able to use water guns but not if they are going to be too heavy for them to hold. Whenever you are playing with any toy, you want to make sure that it is going to be easy to use. If it’s not then the user will quickly lose interest in what they are doing and they will end up never playing with the toy again. One of the biggest decisions that you need to make in regards of this is whether or not you should get a water gun with a pump action or not. Pump action not only requires more coordination but it also requires a higher level of strength too. Most kids are going to be able to use this type of water gun though and it’s only the really little ones who might struggle with it. If you do have a mall child then it’s best to look for water guns without the pump action as this will be easier. As we mentioned before, weight is going to play a big role in the ease of use of a product. If it’s too easy then it’s going to be hard to pick up which means that you won’t be able to point it and shoot in the direction that you wanted too. The overall size of the product is going to be vital too as you want to make sure that the person using it is going to be able to hold it comfortably in their hand, and this includes knowing where the grip is and also the trigger too. Whatever water gun you plan on getting, it’s important to know exactly what you need in your situation in order to get the one that is most going to fit your circumstances. Most of these products are going to be easy to use but that does depend on crucial factors such as age. Q: What Are The 5 Utilitarian Uses for A Water Gun? A: Water guns are best now for splashing everyone else and having fun as you continually get more yet. Aside from their obvious use, there are also a few other clever or fun ways that you would be able to use your water gun apart the obvious. Watering plants – You either might not have a garden hose, it might not reach everywhere you need or it could be that it’s just too powerful. Whatever your needs, a water gun can be a great way to give your plants the water that they need. This can also be a fun way of getting your kids involved in gardening. Sandblaster – Everyone knows that sand can get everywhere, especially when you have been to the beach. Some beaches have long lines to wash off your sand while others won’t let you wash off at all. A water gun could be a part of your beach bag essentials and will be able to blast off that sand and leave you nice and clean. Party gun – If you’re having a party and want to make it fun or unique, then placing a cocktail inside of a water gun is a great way to liven up the part and do something new. As long as you’ve sanitized the gun beforehand, you’ll be able to give people shots as they’ve never had before. An oil can – This is going to be best used for a water gun that you don’t intend to be having fun with anymore, but filling it up with lubricant can be a great way to spray it into those hard to reach places that you otherwise couldn’t have gotten too. Cat control – A popular method of trying to change a cat’s behavior for a long time has been the use of a spray bottle. As long as it doesn’t spray out too fast, a water gun can do the same job perfectly and leave you with a well-trained cat. Q: How To Fix The 3 Most Common Water Gun Problems? A: One of the most common problems that you can see with water guns is when they start dribbling. This can be solved by a few quick pumps or a pull on the trigger. The reason for this is that it means the spring hasn’t fully pushed the trigger back into its groove, or the trigger has slipped off the grove and one of those methods will solve it. If you’ve been using it for a while then there is a good chance that the water gun is going to become jammed. Your first port of call here should be to try and lubricate the water gun but if that fails, you will need to unscrew it and see what is causing the blockage. Another problem that can occur with water guns is that they will develop a crack on them. This can be solved with some epoxy putty which is waterproof and will expand to give you a solid seal and allow you to get a lot more use out of your water gun. Q: How To Clean And Store Water Gun When Not In Use? A: It’s always best to try and flush out a water gun when it’s not being used with clean water to ensure that no dirt or bacteria sits inside of it. When storing, you want to make sure that the gun is completely dry as you don’t want stagnant water sitting there for too long. Mold and mildew can form inside of products that haven’t been used for a long time, and it’s always a good idea to give your water gun a routine check to ensure that this isn’t happening and if it is, it’s best to unscrew the gun and sanitize it. If a water gun is being used for the first time after a while, it’s best to run some warm water through the system so that any water that has been sitting there will be removed and only clean and healthy water will be shot out of it. If you’re looking for water toys for toddlers, water guns can be a huge amount of fun. They have long been a feature of those warm sunny days where kids will be running around after each other trying to get the other drenched in water. They make great beach toys for kids as well as other situations such as battling on a pool floats or simply running around the garden and having fun. In order to get the best water gun for you, you have to bear a few key details in mind as the size and weight are going to be important. You want to make sure that the user is able to comfortably hold the water gun for the duration of their time outside. The water capacity is going to play a big role in that and while you want to have the largest capacity possible; you need to think about the relevant weight. If you have a readily accessible supply of water then a water gun with a medium capacity would be fine. Hopefully this guide has given you all the information that you need in order to choose the perfect water gun for you. Once you have, you or your kids will be able to head out there and enjoy endless hours of fun.